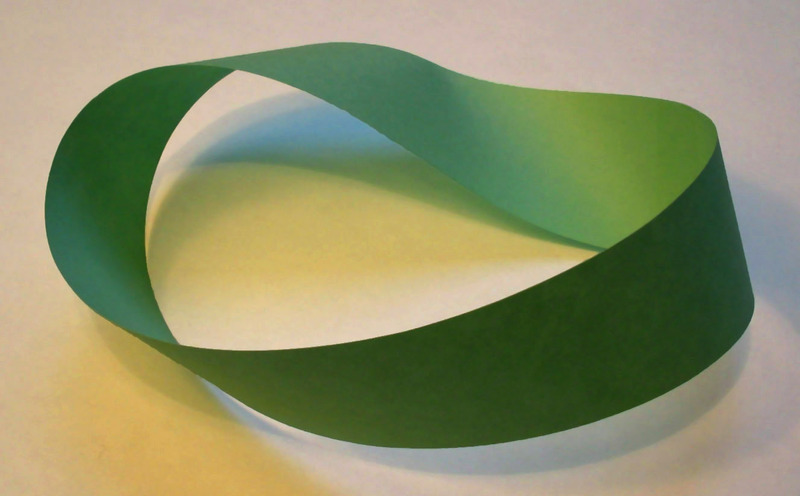 Treating anxiety can make you feel like you are on a Mobius strip. An anxious person is usually anxious because they are trying to control something they can't control. You can't control other people. You can't control the future or the past. You can't control what happens in the country. People die and get sick, and it is hard to predict when it will happen. Other escapes, such as alcohol, blogging, or Oxycontin. Becoming really busy so they don't have time to think about it. Faith can provide comfort, but our natures and the world we live in makes it impossible to avoid anxiety. Plus, people of faith often have an added problem: they feel like their anxiety is a personal and moral failure. America is a place of plenty and so everyone has much more to lose. Everyone also can hide in all the stuff they have and all the things they have to do and hope things don't fall apart in the mean time. But they often come to my office struggling with "stress" and wanting to fix it. The words I often hear them are, "I look at my life and see all of the good things/blessings I have, and I wonder why I am anxious. Look at all the advantages I have! I shouldn't be anxious, should I?" To which I respond, "So are you telling me that having a nice home, a nice marriage, healthy kids, lots of money, and a good job are the keys to a secure and happy life?" The truth is, the more you have, the more you have to lose. The more cards that are stacked onto the house of cards - the more stories of the house you build - the more precarious things get. You could get sick, the stock market could bottom out, your child could get cancer, your spouse may be unfaithful; all of these things are only amplified by how important each of these things are. Hence, America is the land of the anxious. In the exam room, the exchanges can be quite complicated. When someone comes to me for anxiety, almost always that anxiety is causing collateral damage in their lives. Either they are becoming angry, compulsively running to an addiction, obsessing about something, withdrawing from relationships, or driving other people nuts. The fact that they are coming to their doctor to talk about anxiety makes them anxious. They don't want to look crazy. So I talk about feeling out of control, and about how behaviors can stem from that. They become more anxious because my discussion is about things that they don't want to think about. When they show more anxiety as I talk about this, they get anxious about how they are coming across to me. Are they weak? Are they stupid? Are they crazy? The problem is that anxiety is irrational. You don't wake up in the morning and decide you are going to be anxious. You don't become anxious out of conscious thought or reason. It comes up despite your knowledge of its irrationality. This is made even worse by people around them who give the simple instruction: "don't be anxious," as if anxiety was a switch that can be flicked. This is why people worry about being crazy; they act in totally irrational-appearing ways. They act in ways they know they shouldn't act, but have no control to stop. That's why they are seeing me. That's why they worry about what I will think. But at the same time that anxiety is irrational, it is reasonable. It doesn't come without cause. We are really out of control. Bad stuff could happen at any time. Life is uncertain. The American psyche is obsessed with denying these facts, saying that things should be good, in control, and our futures should be certain. When people are forced out of denial or escape, they burst out in anxiety. There is certainly a lot to be anxious about, and this is magnified if we believe that things should be different. So as I speak about anxiety, I observe the person getting more anxious. Since my goal is to help, comfort, and give confidence to them, I start to get anxious. What can I say that will help unroll this anxiety? Am I saying the wrong thing? And so the ping-pong match of anxiety goes on. I talk of medications for anxiety that may help them deal with problems. I tell them that these medications are not the fix, but they may allow them to work through the root-causes of their anxiety. I explain that the real treatment for anxiety is self-examination and discovery of what unchangeable things they are trying to change. My talking about medications, of course, makes them anxious. I must really think they are crazy to be suggesting medications! They ask me if there are any side effects to the medication. I can't lie to them, as many of them are going to go right to the internet or the drug PI and see the huge list of possible side effects. So I tell them about the main ones, but do my best to reassure them that I wouldn't prescribe anything I didn't think would help. Because I am not trying to scare them away from something that may help, I become uncomfortable - trying to craft words that will inform without worrying. They pick up on this discomfort and become anxious that I am hiding things from them. This makes me anxious as well. There is no solution for this. Life is uncertain, and we live much of our lives in the uncertainty. Having faith that hardship will, in the end, turn out for the best can help people cope; but it doesn't take away the uncertainty, the fear, or the worry. My conclusion is that we live a large part of our lives in uncertainty, suffering, and hardship. The thing that leads us to anxiety is not the hardship itself, but the belief that we shouldn't be in that hardship in the first place. The source of worry is the fact that we have bought the sit-com gospel of things working out by the end of the half hour show. Life is far more complex, and is usually not as easily fixed. I sit and see people suffering all day long, so why did it take me so long to figure this out? I can't fix you. I might be able to help, but I am not God. Living life in the real world is painful and uncertain. It stinks to live in suffering and worry, but you get through it, not around it.